Here can be found posters and postcards created for my own and other people's projects. 2012. 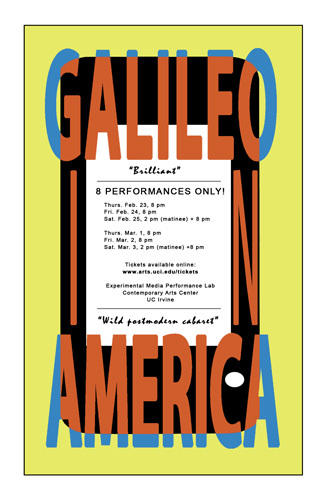 Poster for west coast premiere of Galileo in America at the Contemporary Arts Center, UC Irvine, its design partly inspired by a cellphone that was used in the piece. Sept. 2001. Poster in response to the attack on the World Trade Center on Sept. 11, 2001, and the aftermath. 2000. Poster for premiere of my multimedia performance work, produced at Side Street Live, Los Angeles. 1999. Poster for a festival celebrating the 150th anniversary of the birth of August Strindberg, produced at Theater 22, New York. 1998. Poster for premiere of my performance work in the New York International Fringe Festival, produced at Collective Unconscious, New York. 1998. 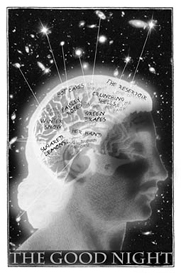 Poster for premiere of a new play by Courtney Baron, Theater for the New City, New York. 1998. 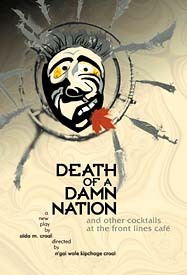 Poster for premiere of a new play by Aida Croal, produced at LaMaMa E.T.C., New York. 1998. 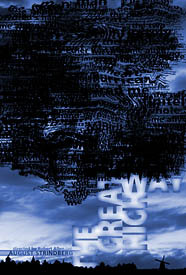 Poster for premiere of a new play by Aida Croal, Trilogy Theater, New York. 1997. Poster for a production of August Strindberg's last play, Horace Mann Theater, New York.